A new concept of software for processing all types of geospatial data with real integration of different information. Experience easy import of data, calculations, adjustments, scan registration and management of the clouds, points, measurements, surfaces and images, topographical utilities and drawing functions all in one application. From import to final drawings, X-PAD Office Fusion offers you the best tools without having to pass data from one program to another. You can load data from total stations, GPS, digital levels and laser scanners, and calculate, view and manage in one software. You can connect TPS survey, GPS survey, levels, laser scanner sessions and see everything together. A modern working environment, designed to manage geospatial data, and a powerful CAD 3D are the basic framework on which topographic and laser scanner modules have been developed. Data can be viewed and managed on table grids with countless powerful functions for searching, filtering and editing. With X-PAD Office Fusion you can handle different types of data: measures, points, drawings, surfaces, cross-sections and point clouds. With the Project Manager you can organise the data within the same job file. Multiple survey sessions and different groups of drawings can be managed and data made visible or invisible at any time. 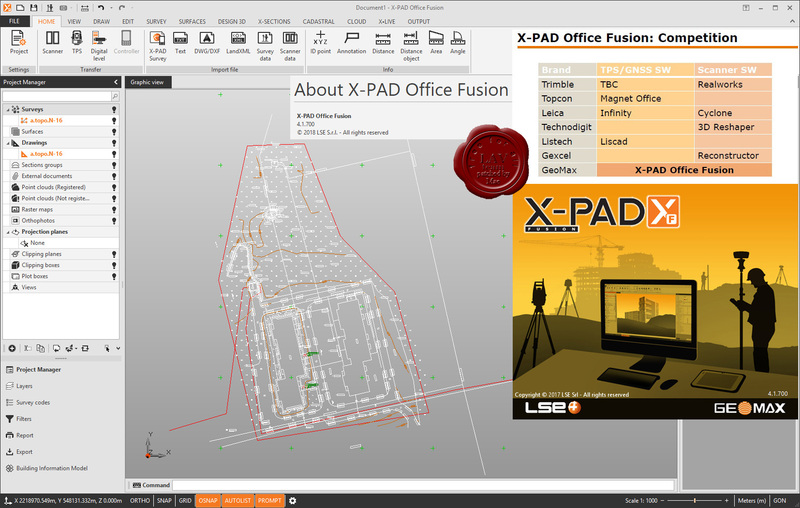 The X-PAD Office Fusion CAD combines both, a CAD designed to operate according to the standards defined by AutoCAD but also made for topographic use. When you have to indicate a coordinate, you can type the name of the corresponding point, or you can select topographic objects (points and lines) according to the survey code. If you are a surveyor, you will find special commands for the creation of your drawing.